The other finalists for this year’s Person of the Year included such names as Facebook founder Mark Zuckerberg, Beyonce, Russian president Vladimir Putin, the whistleblowers of Flint, Michigan, and US gymnast Simone Biles. 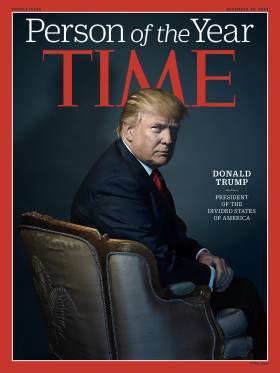 very US President has been named Time Person of the Year at some point, and starting with President Ronald Reagan in 1980, every US President has been named Person of the Year on the year of their election. This is not without precedent. No Comment to " Donald J. Trump named Time's person of the year "